I am really into making flowers as embellishments at the moment and when I came across the sketch with a twist of flowers at The Sweet Stop, I just had to have a go. Totally Gorjuss and Pile It On also have a flowers theme and Saturday Spotlight's is MESSY, wey hey that's what I like. So this is it, what do you think? This type of flower is totally new to me and they have been made with roughly torn cirles of card which have been curled around the edges and I added sparkle (of course) with the Cosmic Shimmer Aqua twinkles. There's lots of glitz on here as the nesties labels (used on my Big Shot) have been edged with Stickles Waterfall and Holly as well. I used the distressing tool on the flowery backing paper from K&Co and it has been misted with Glimmer Mist Blue Skies and Cosmic Shimmer Mist Golden Mint. 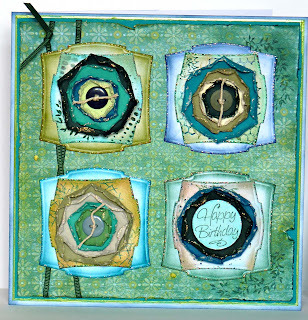 Two of the corners have been distressed with Pine Needles ink and printed with a leafy twig stamp from Art Impressions. I added the ribbon and backing paper (edged with Lime Zest Pearlidoodles) to complete the look. Experimenting with colours in the same range seem to be a thing for me at the moment and I enjoyed putting these together. Your flowers are wonderful! Great job of distressing! So glad you joined us at Saturday Spotlight this week! Hope to see you again next challenge!! love the results you get with the different shades and tones of colour, and great to see the torn circle flowers again. Fab piece. I love your card - really different. I found it by linking on the Anyone for Anya site - but you don't list that as one of the challenges. Your card is lovely but to be eligible for the drawing for the Anyone for Anya? challenge it must contain a Greetings Farm image. This is a really original card Brenda. I love those flowers. Thanks for joining us at TG. ps I have blog candy. Really terrific card. I love your distressed flowers. I'm really enjoying making my own flowers lately to - and distressed is my favorite style, so you card really appeals to me. Great job on trying a new technique. So happy you could join in the fun with Our Creative Corner and Pile it On this week! Gorgeous effect on these distressed flowers, especially striking in this repeating pattern! Thanks for playing in this week's Spotlight challenge! !